It is 8 o’clock in the morning, and the streets of Aundh, a posh locality in Pune, are yet to see the usual jostling of office-goers. Amid a few pedestrians is a petite woman, wearing an oversized blue shirt over a chiffon sari, gently pushing a green steel cart, which has Pune Municipal Corporation written on it in Marathi. She steers her cart underneath a tree and begins to rummage through its contents. “My day begins at about seven in the morning,” she tells this reporter, sorting a bundle of creased paper and plastic wrappers with her bare hands. “I visit apartment complexes on DP road, near Parihar Chowk, and collect their waste.” she says as she carefully deposits the contents of her hand into a plastic sack lying besides the cart. Next she fishes out a few alcohol bottles that she tilts to drain out the liquid inside and gently places them on the ground. For half an hour she diligently segregates her day’s collection and quietly puts them in different sacks or piles them on the roadside. 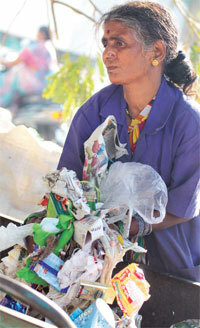 She is the first, and one of the most important, cogs in Pune’s waste disposal machinery. Like her, every day 9,000-odd collectors scrounge the city, picking up waste. “We are an essential service like the police and the medical profession. The day we decide to go on strike this city will begin to stink,” she says. Narode’s confidence comes from being part of an organised group of waste collectors which operates under a cooperative called SWaCH Seva Sahakari Sanstha Maryadit. SWaCH is short for solid waste collection and handling. It is a wholly owned cooperative of self-employed waste pickers, with about 2,300 members. Authorised by the Pune Municipal Corporation (PMC) to go door to door to pick up waste, SWaCH operates in all the 15 wards of Pune. “Pune is the only city in India which recognises picking waste as a formal profession,” says Mangal Pagare, chief executive officer of SWaCH. In 1993, waste pickers and waste buyers decided that to have better working conditions and to get their work recognised as a profession, they must unionise themselves. This collective resolve gave birth to Kagad Kach Patra Kashtakari Panchayat (KKPKP). Poornima Chikarmane, associate professor at SNDT Women’s University in Pune, was one of academics who helped KKPKP mould into a union. In her paper, Integrating Waste Pickers into Municipal Solid Waste Management in Pune, India, published in 2012, she said waste pickers recovered material for recycling, reduced the cost of handling municipal solid waste, generated employment and contributed to public health and the environment. Chikarmane says thousands of waste pickers marched through the streets of Pune in 1993, asserting their right to the city’s recyclables. Their slogan was “Kachra Amchya Malkicha, Nahi Kunachya Bapacha”, which translates to “we own the waste, it does not belong to anybody’s father”. In the convention where KKPKP was formed, the waste pickers asserted their right to live a life of dignity without harassment, says Pagare. After the rules for handling municipal solid waste (MSW) were notified in 2000, Pune found itself terribly unprepared to comply with them. It did not even have an MSW department. “Using its own vehicles and employees, PMC could collect waste from only 7 per cent of the households. Of this 86 per cent was collected from community bins placed in public areas,” says Chikarmane. The practice then was to collect, transport and dispose of. SWaCH was set up in 2007 by KKPKP to undertake front-end waste management services for PMC. An agreement was signed between the two in 2008. This pilot project involved about 1,500 workers. SWaCH operates under a model based on recovery of user fee from households, while infrastructure and management support is given by PMC. Every day SWaCH collects about 600 tonnes of garbage, of which 140 tonnes is dry. It covers about 400,000 households, which is nearly half of the total in the city, informs Sanjay Gawde, PMC’s additional municipal commissioner in charge of MSW. “Segregation of waste is mandatory in Pune but not all households segregate their waste,” says Gawde. About 43 per cent of the collected waste comes in segregated form, he adds. Pagare concurs but says that Pune is still better off than most of the other cities in India. SWaCH’s entry into waste management has increased the rate of segregation at the source. SWaCH helps in maintaining compost pits at about 80 large residential societies, with an aggregate capacity of 6 tonnes of waste per day across the municipality. SWaCH members collect garbage from citizens’ doorsteps and deposit it at the designated PMC collection points. Each waste picker collects waste from 150 to 200 households. The user fee varies from a minimum Rs 10 a month to Rs 40, depending on the area. SWaCH members sort unsegregated waste before handing it over to MPC. They can also sell the recyclable waste to kabariwallas to earn extra income. Households can call up a helpline, run by SWaCH, to access these services or to complain about bad service. What SWaCH has done is use an economical way of door-to-door collection of waste. PMC spends a little over Rs 4 per household using SWaCH’s services. But Pagare says the remuneration for the waste pickers should be increased. “We are not asking for much but just Rs 1 per day, or Rs 30 per month, as a minimum user fee across the city,” she says. The minimum fee of Rs 10 was fixed in 2008, and PMC has not revised it in the past seven years,” she says. Other problems include lack of sorting sheds where workers can segregate their waste. There are 76 municipal wards that have about 40 sorting sheds. The synergy between SWaCH and PMC has produced an efficient system for collecting waste. This has helped waste pickers get formal recognition and steady income. PMC has benefited from an efficient system of door-to-door collection. This is just one of the many strategies PMC is using to solve Pune's waste problem. I lived in Denmark. There seperate dustbins are placed for glass and toxic materials. The Private Contractors find it easy to segregate the material while recycling. Why not we follow this atleast in Metros?